At such moments the sights, the sounds, the feelings, can be horribly familiar. The incongruous silence when there should be noise; still when there should be buzz; restraint when their should be celebration. We all know it, and the horrid sense of shock and then of uselessness as we watch on, desperate. And however much we love motor racing, it also is - and always will be - dangerous. The risk can be minimised, indeed it has been vastly as we know. But it cannot be uncoupled. Perhaps against expectations - and the expected vast quantities of rain indeed arrived - we had a motor race in Suzuka today for the Japanese Grand Prix. And for the most part we had a good one. One of remarkably good judgement by all of the drivers too, in addition to their considerable bravery and skill. But it came to a rather abrupt stop on lap 42. As intimated come the commencement time of 3pm locally the track was very wet, which resulted in a start behind the safety car, a red flag then another safety car period. But the rain had relented before the time that the cars were released definitively. The circuit as a consequence was, if still difficult, suitable for green flag action. Late on in the race rain returned, and some indeed dived in to the pits for full wet tyres. Adrian Sutil on the long Dunlop Curve lost his Sauber on the now more treacherous surface, and came to rest in the tyre wall. He got out of the car OK, and marshals and a recovery vehicle gathered on the danger side of the barrier to retrieve the stricken Sauber. But then dark clouds of the metaphorical kind gathered. Just over a lap later, with the Sutil incident up to that point covered only by yellow flags, the safety car was suddenly deployed to some bewilderment, as was - proceeding with much more urgency - the medical car which headed straight to the Sutil crash scene. Chillingly, it occurred that Jules Bianchi had disappeared from the timing screens. It transpired eventually that Bianchi next time around had gone off at the same point as Sutil and hit the recovery vehicle. A sombre Sutil noted to reporters later: 'It was more or less the same crash (as me) but the outcome was a bit different'. As you might imagine a premature and permanent halt was called to proceedings there and then. It was soon reported that Bianchi had been knocked unconscious and had been taken to hospital. Later the FIA confirmed that he's suffered a 'severe head injury' and is in surgery before being moved to intensive care. At the time of writing we know no more. It is understandable, though perhaps regrettable, that some in their shock seek recrimination at such moments. The reaction reflects human nature most likely. And if you are one who knows Bianchi personally this effect will almost certainly be multiplied. Further it goes without saying also that in the cold light of day whatever lessons that can be learned from such incidents should be. The recrimination aired in this case included that the race - with the weather behaving exactly as forecast for days - wasn't run earlier in the day, or on the Saturday. It was the Japanese promoters, rather than the FIA or FOM, who insisted on not making a change. In the spirit of fairness I'm sure they had their reasons for doing so too. 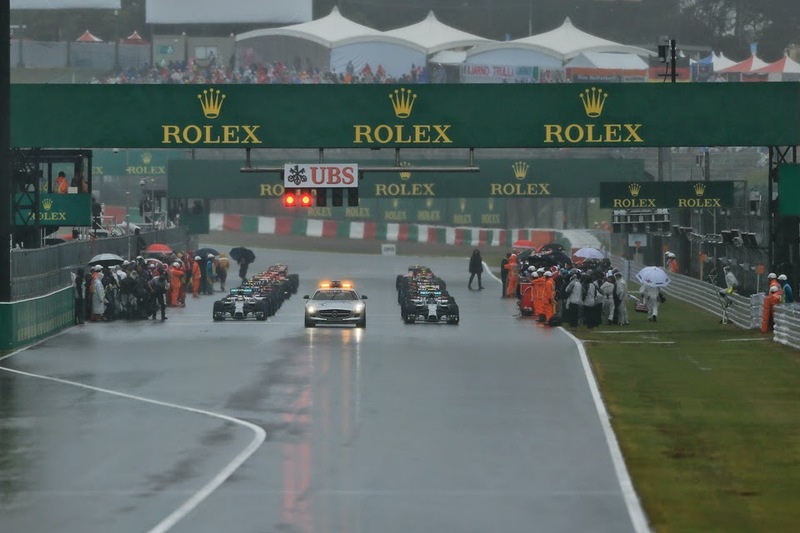 In a similar vein at least one driver made a similar criticism that before the point of Sutil's crash the safety car hadn't been deployed in the intensifying rain. But still, and with respect, such points seem to me to have only limited value here. As after all and as noted after early delays we did get a representative motor race today in Suzuka in far from terrible track conditions. 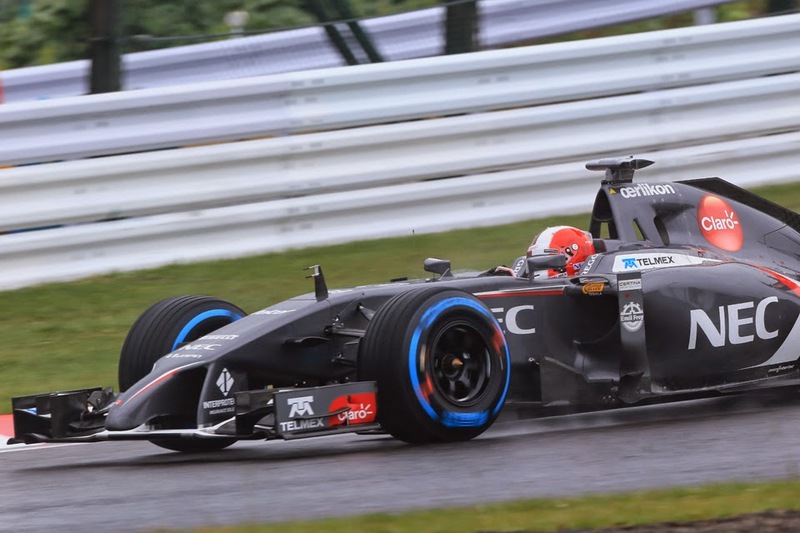 The cars were on intermediate tyres rather than the full wets for the vast majority of it. And even at the time of the accident the conditions, while certainly worsening, were not hideous. Indeed prior to Sutil not a single driver had crashed out. There also was, unfortunately, some recrimination based on the medical helicopter supposedly being unusable in the weather conditions, an idea which turned out to be false. But where we do in probability do have a learning point is on the use of the recovery vehicle in front of the barriers in that precise situation without a safety car appearance at least. Once again the F1 fates appear to be possessed with a wicked and disquieting sense of irony, given as we are almost exactly 20 years on from a close to identical incident at exactly the same corner at the same venue. Then Martin Brundle, and to this day he doesn't know how, somehow missed the exposed recovery vehicle at the last split-second but unfortunately hit a marshal instead, breaking his leg. Of course, recovery vehicles in front of barriers to remove stricken cars as races still go on, covered only by double-waved yellows rather than safety cars, are common up and down the motorsport ladder. But perhaps just as was the case in 1994 if such a recovery takes place in wet, certainly worsening, conditions then a safety car should be deployed as standard. We have seen repeatedly that if conditions are worsening then even a healthy lift from the throttle in an F1 car and extreme circumspection doesn't necessarily save you from aquaplaning. Brundle himself, watching on today no doubt with a deep jarring sensation, in my view got it absolutely spot on in his response said on TV later. 'You could have had the race this morning and still had the particular incident' he said, 'it's not like he's (Bianchi) gone down the straight and lost it on a ridiculous amount of water or something. His TV colleague Anthony Davidson concurred, and ventured further: 'Maybe procedures have to be looked at: no diggers or recovery vehicles on track in extreme conditions like that when it's raining heavier and heavier.' Johnny Herbert added that greater use of cranes, which remain behind the barriers, could be part of the solution too. But such debates can wait for another day. The whole F1 community is united in concern right now, for a talented and promising racer and pleasant young man. All that is left for us to do now is to wait and to hope. While it seems crass to be talking about the outcome of a mere F1 race at such times for the sake of recording I'll try to cover it briefly. 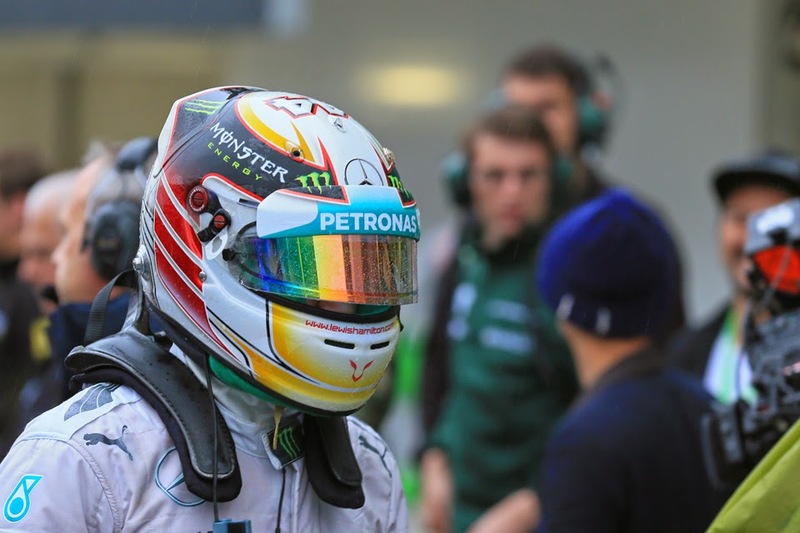 Lewis Hamilton won the Japanese Grand Prix today from Nico Rosberg, and thus extends his championship lead by seven points to ten. Nico led from the off but come mid-race Lewis's tyres appeared to be in better nick, and having closed and hounded his rival for a few laps he passed in a fine brave move around the outside of turn one. This proved decisive. As anticipated the race was in large part a private Mercedes affair, though for large parts the Red Bulls looked even faster, possibly to the point that they might require the Mercs to step down by the end. Unfortunately for them they'd lost close to half a minute to the silver cars in the early going, stuck behind the struggling Williams, and having cleared them by the time they got reasonably close to the Mercs Hamilton at least appeared to have enough in hand to hold them off. Third and fourth with Vettel ahead on the post red flag count back was their reward. While using the financial system forcing businesses in order to lower your expenses, relocating everyday research characteristics in order to 'Dark clouds, perhaps' will allow this company to reduce their particular internal My partner and i. Capital t. service prices. Impair research enables you to reap the benefits of products and services in addition to capabilities that you might definitely not be capable of afford or maybe service by owning all of the products and/or computer software needed to operate it.